Reviews: Steinberg Cubase 10 (cover), Korg Volca Modular, Softube Modular, Audient iD44, EastWest Voices Of Soul, Graham Audio Swisstone LS3, Headrush Gigboard, Make Noise René, Nektar Pacer, Pittsburgh Modular Microvolt 3900, Pulse Techniques EQP-1A, Spitfire Audio Eric Whitacre Choir, Tascam Model 24, UAD 9.7 and more. Techniques + People: Inside Track: Andrea Bocelli 'Fall On You', Tatsuya Takahashi: Synth Designer, Dave Cobb: Producer+Engineer, Mix Rescue: Piano+Vocals, Piano Recording: Part 2 [video] plus DAW workshops. Vowel is a digital oscillator module with all the gubbins you might need in order to get vowel sounds with just a trio of controls. Looking for pre-mixer sweetening? Finaliser R‑EQ offers three-band parametic EQ, a two-way aural enhancer that works on the top and bottom end of the audio, and basic DSP effects like reverb and delay. The iD44 is a versatile USB 2.0 desktop interface with Audient's trademark audio quality. Digital wireless systems are all the rage these days, but good old UHF still has some unique advantages. Speaker decouplers aim to isolate speakers from the surface on which they sit. This newer, more affordbale DMSD 50 Pro design has been optimised for speakers weighing up to 12kg (ie. most nearfield monitors). In the LS3, Graham Audio have sought to recreate a classic BBC monitor but without the 'classic' price tag. The Gigboard crams the processing power of Headrush's flagship Pedalboard into a compact and easy to use format. **** 4/5 stars. Synthetic Strings focuses not on string synthesizers per se, but on synthetic textures inspired by synthesizers and string machines. Korg bring West Coast modular synthesis to the masses with their most ambitious Volca yet. Pittsburgh's desktop semi-modular has its eye set firmly on the experimental. Is this, as the manufacturers claim, the most authentic recreation of the venerable PulTec EQP‑1A? The CP Series speakers represent QSC's first attempt at an 'entry level' range. We put them to the test! A chance meeting with a leading choral composer sparked a major new Spitfire library. 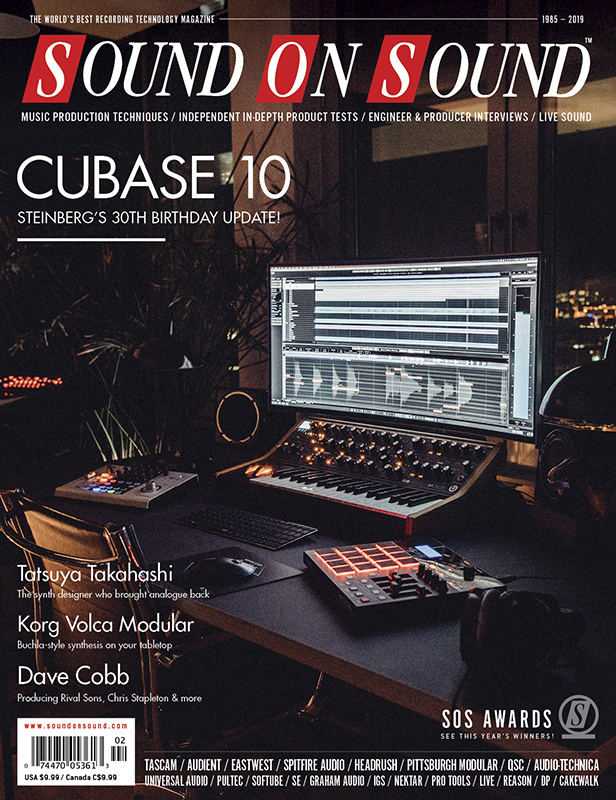 Cubase celebrates a milestone birthday with an update that makes almost every aspect of the program slicker and easier to use. Offering both retro analogue simplicity and modern digital recording facilities, can this device be master of all trades? ***** 5/5 stars. Produced by Grammy-winning engineer Josh Wilbur and Lamb Of God drummer Chris Adler, this is a collection of hard-hitting drums that sound big in every sense of the word. **** 4/5 stars. Unorthodox Audio are a fledgling sample library company, set up by composers Richard Norris and Mike Gunn with the aim of trying to "capture something wonderfully peculiar within each virtual instrument". Cakewalk has all the tools you need to put together a seamless DJ‑style album. Listing of all SOS February 2019 articles that hold associated media files for audio examples. Our engineer applies his mixing chops to put a professional sheen on an unrepeatable vocal-and-piano performance. Here are the audio files that accompany February 2019's Mix Rescue article. Multi‑lane editing is the secret to working with MIDI notes and drum layers in context within Reason. Max For Live has a rich assortment of step sequencers. We look at some of the best. Q. How can I record from my pedal's headphone output? I think an unbalanced stereo source will work fine into a balanced TRS input, but only the left channel will be heard. Am I correct? Read more about Q. How can I record from my pedal's headphone output? Q. When should I use mono reverb as opposed to stereo reverb? I'm not really sure when it's best to use mono reverb effects — and how to pan the reverb when doing so — and when to use stereo reverb? Read more about Q. When should I use mono reverb as opposed to stereo reverb? Q. Will phantom power damage a valve mic? My Sterling Audio ST66 tube condenser mic has a mains AC power supply. Am I right in thinking therefore that I shouldn't use the 48V phantom power from my Audient iD4? Read more about Q. Will phantom power damage a valve mic? This year’s SOS Awards once again place their emphasis on innovation and contemporary design. Check out the winners! Read on to discover all the very worthy close contenders in each category who have been awarded our Highly Commended accolade. Media content for the February 2019 issue.